Wealthy car enthusiasts at an auction in Moscow can choose between the latest super machine or a Nissan limo that smells of Leonid Brezhnev's tobacco. Millions of dollars' worth of rare cars - including historic Soviet stalwarts - are going under the hammer. Lots on offer include Brezhnev's Nissan limousine and an armoured car used by former leaders Mikhail Gorbachev and Boris Yeltsin. It is the first commercial car auction ever conducted by Sotheby's in Russia. In a country which is home to 33 billionaires, Communist-era vehicles are among the main attractions. The BBC's James Rodgers, in Moscow, says the makers of the Zil limousine - a symbol of Soviet socialist engineering - can scarcely have imagined that it would end up the centrepiece of this most capitalist auction. The model which is up for sale at the Super Bike and Car exhibition was used by Mikhail Gorbachev, the last leader of the USSR, and Boris Yeltsin, the first president of post-Soviet Russia. It is not thought that Mr Yeltsin actually got behind the wheel. Our correspondent says the organisers of the sale describe the Zil as a masterpiece of armoured cars, its chassis apparently constructed so that the vehicle could not be turned over by an explosion. 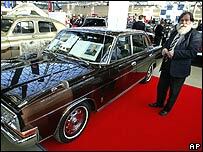 The Nissan limousine was made specially for Leonid Brezhnev - Communist Party leader from 1964 to 1982 - has its own special piece of Soviet history. "The car is good, just wonderful," says owner Boris Lakhmetkin. "You know, even now I can smell the aroma of Brezhnev's tobacco. I do not smoke myself, so I can smell it very strongly." The starting price for some of the Bentleys on sale is about $600,000 (£342,800; 496,200 euros). 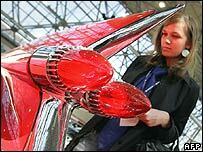 Some experts say their chances of being sold at auction are higher than those of the exotic Soviet models. Lord Poltimore, chairman of Sotheby's in Russia, is conducting the sale. "Art-historically, it's quite interesting - and it's an important time and the market is right. There's lots of money in Moscow and I think the sale should do well. "There are more than 50 lots up for sale - rare wines and whiskies as well as the cars. The wealth generated by soaring oil and gas prices means that plenty of Muscovites are looking for luxury goods."